Granbury&apos;s Fourth of July celebrations are always unforgettable. Thousands flock to Granbury to take part in the small town festivities and celebrate all things America. The parade around the Historic Granbury Square, the vendors, the iconic Lake Granbury and a top-rated firework show to finish it all off, all make for a memorable Fourth of July for the entire family. Plan your summer getaway in Granbury for the Fourth of July! 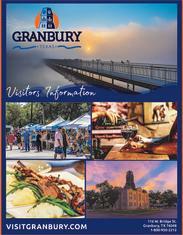 For more information on Granbury&apos;s Fourth of July, contact the Granbury Chamber.